B and T cells, parts of the adaptive immune response, contain receptors that can identify antigens derived from pathogens. The adaptive immune response is slower to develop than the innate immune response, but it can act much more powerfully and quickly than the innate immune response against pathogens that it has seen before. B and T cells are lymphocytes, or white blood cells, which are able to recognize antigens that distinguish “self” from “other” in the body. B and T cells that recognize “self” antigens are destroyed before they can mature; this helps to prevent the immune system from attacking its own body. The adaptive, or acquired, immune response to an initial infection takes days or even weeks to become established, much longer than the innate response. However, adaptive immunity is more specific to an invading pathogen and can fight back much more quickly than the innate response if it has seen the pathogen before. Adaptive immunity occurs after exposure to an antigen either from a pathogen or a vaccination. An antigen is a molecule that binds to a specific antibody, often stimulating a response in the immune system as a result. The adaptive immune response activates when the innate immune response insufficiently controls an infection. In fact, without information from the innate immune system, the adaptive response could not be mobilized. There are two types of adaptive responses: the cell-mediated immune response, which is controlled by activated T cells, and the humoral immune response, which is controlled by activated B cells and antibodies. Upon infection, activated T and B cells that have surface binding sites with specificity to the molecules on the pathogen greatly increase in number and attack the invading pathogen. Their attack can kill pathogens directly or they can secrete antibodies that enhance the phagocytosis of pathogens and disrupt the infection. Adaptive immunity also involves a memory, which gives the host long-term protection from reinfection by the same type of pathogen; upon re-exposure, this host memory will facilitate a rapid and powerful response. Lymphocytes, which are white blood cells, are formed with other blood cells in the red bone marrow found in many flat bones, such as the shoulder or pelvic bones. The two types of lymphocytes of the adaptive immune response are B and T cells. Whether an immature lymphocyte becomes a B cell or T cell depends on where in the body it matures. The B cells remain in the bone marrow to mature (hence the name “B” for “bone marrow”), while T cells migrate to the thymus, where they mature (hence the name “T” for “thymus”). T cell by SEM: This scanning electron micrograph shows a T lymphocyte. T and B cells are indistinguishable by light microscopy, but can be differentiated experimentally by probing their surface receptors. The maturation of a B or T cell involves becoming immunocompetent, meaning that it can recognize and bind to a specific molecule or antigen. This recognition, which is central to the functioning of the adaptive immune response, results from the presence of highly specific receptors on the surfaces of B and T cells. On B cells, these receptors contain antibodies, which are responsible for antigen binding. An antibody is specific for one particular antigen; typically, it will not bind to anything else. Upon antigen binding to a B cell receptor, a signal is sent into the B cell to turn on an immune response. B cell receptors: B cell receptors are embedded in the membranes of B cells and bind a variety of antigens through their variable regions, or antibodies. The signal transduction region transfers the signal into the cell. Meanwhile, T cell receptors are responsible for the recognition of pathogenic antigens by T cells. Unlike B cells, T cells do not directly recognize antigens. Instead, they recognize antigens presented on major histocompatibility complexes ( MHCs ) that cells use to display which proteins are inside of them. If a cell is infected, it will present antigenic portions of the infecting pathogen on its MHC for recognition by T cells, which will then mount an appropriate immune response. Unlike antibodies, which can typically bind one and only one antigen, T cell receptors have more flexibility in their capacity to recognize antigens presented by MHCs. T cell receptors (TCRs): A T cell receptor spans the membrane and projects variable binding regions into the extracellular space to bind processed antigens via MHC molecules on APCs. It is the specific pathogen recognition (via binding antigens) of B and T cells that allows the adaptive immune response to adapt. During the maturation process, B and T cells that bind too strongly to the body’s own cells’ antigens are eliminated in order to minimize an immune response against the body’s own tissues. Only those cells that react weakly to the body’s own cells will remain. This process occurs during fetal development and continues throughout life. Once they are immunocompetent, the T and B cells migrate to the spleen and lymph nodes where they remain until they are called on during an infection. B cells are involved in the humoral immune response, which targets pathogens loose in blood and lymph, while T cells are involved in the cell-mediated immune response, which targets infected cells. The humoral immune response defends against pathogens that are free in the blood by using antibodies against pathogen-specific antigens. Antigens are proteins and other macromolecules that bind to a specific antibody and are used by the immune system to recognize pathogens. 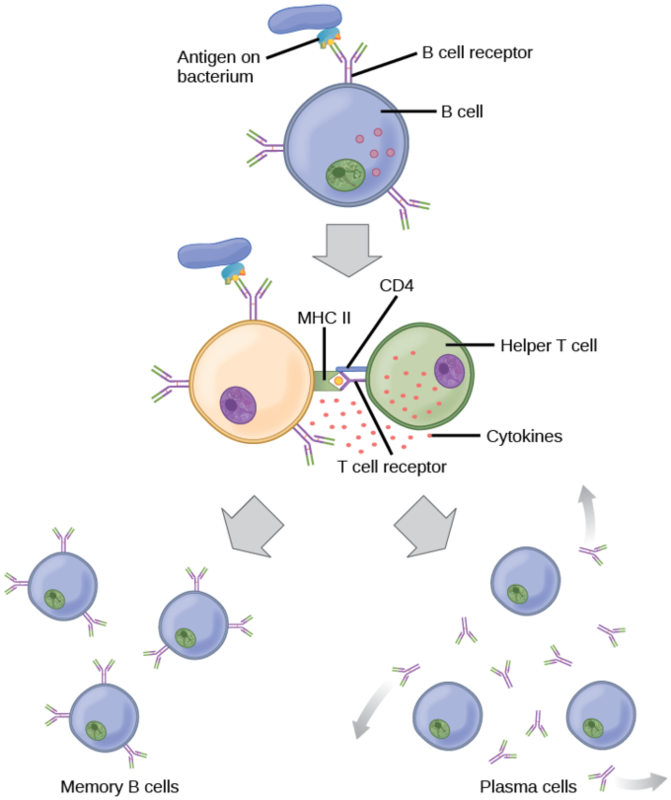 B cells express receptors (BCRs) on their membrane which contain antibodies; these antibodies allow B cells to detect pathogens and release further antibodies to fight the infection. Antibodies fight infections in three ways: they mark pathogens for destruction by phagocytic cells in a process known as opsonization, they coat key sites on pathogens necessary for infection, and they induce the complement cascade to occur against antibody-bound pathogens. Once the adaptive immune response has encountered an antigen, B cells will divide to produce plasma cells, which rapidly secrete antibodies to that antigen in a process called active immunity. The humoral immune response fights pathogens that are free in the bodily fluids, or “humours”. It relies on antigens (which are also often free in the humours) to detect these pathogens. An antigen is a biomolecule, such as a protein or sugar, that binds to a specific antibody. An antibody/antigen interaction may stimulate an immune response. Not every biomolecule is antigenic and not all antigens produce an immune response. B cells are the major cell type involved in the humoral immune response. When a foreign antigen (one coming from a pathogen, for example) is detected, B cells in the body that recognize that antigen will begin to produce antibodies as a means of fighting off the foreign invader. During maturation, B cells gain antigen receptor molecules, termed B cell receptors (BCRs), which are displayed in large numbers, extracellularly on their membrane. These membrane-bound protein complexes contain antibodies, which enable specific antigen recognition. Each B cell initially produced has only one kind of antibody (antigen receptor), which makes every B cell unique. It is the immense number of B cells in the body, each of which produces a unique antibody, that allows the immune system to detect such a wide variety of pathogenic antigens. B cells containing antibodies that recognize “self” antigens are destroyed before they can mature, preventing the immune system from attacking the host. Once B cells mature in the bone marrow, they migrate to lymph nodes or other lymphatic organs, where they may begin to encounter pathogens. B cell receptors: B cell receptors, containing antibodies (termed antigen-binding site in the picture) are embedded in the membranes of B cells and bind a variety of antigens through their variable regions. When a B cell encounters the antigen that binds to its receptor, the antigen molecule is brought into the cell by endocytosis, reappearing on the surface of the cell bound to an MHC class II molecule. When this process is complete, the B cell is sensitized. In most cases, the sensitized B cell must then encounter a specific kind of T cell, called a helper T cell, before it is activated. This activation of the helper T cell occurs when a dendritic cell presents an antigen on its MHC II molecule, allowing the T cell to recognize it and mature. The helper T cell binds to the antigen-MHC class II complex and is induced to release cytokines that induce the B cell to divide rapidly, making thousands of identical (clonal) cells. These daughter cells become either plasma cells or memory B cells. The memory B cells remain inactive at this point. A later encounter with the antigen, caused by a reinfection by the same bacteria or virus, will result in them dividing into a new population of plasma cells. The plasma cells, on the other hand, produce and secrete large quantities, up to 100 million molecules per hour, of antibody molecules. An antibody, also known as an immunoglobulin (Ig), is a protein that is produced by plasma cells after stimulation by an antigen. Antibodies are the agents of humoral immunity. Antibodies occur in the blood, in gastric and mucus secretions, and in breast milk. Antibodies in these bodily fluids can bind pathogens and mark them for destruction by phagocytes before they are able to infect cells. These antibodies circulate in the blood stream and lymphatic system, binding with the antigen whenever it is encountered. The binding can fight infection in several ways. Antibodies can bind to viruses or bacteria, which interferes with the chemical interactions required for them to infect or bind to other cells. The antibodies may create bridges between different particles containing antigenic sites, clumping them all together and preventing their proper functioning. Antibody neutralization can prevent pathogens from entering and infecting host cells. The neutralized antibody-coated pathogens can then be filtered by the spleen to be eliminated in urine or feces. The antigen-antibody complex stimulates the complement system described previously, destroying the cell bearing the antigen. Antibodies also opsonize pathogen cells, wherein they mark them for destruction by phagocytic cells, such as macrophages or neutrophils. Additionally, antibodies stimulate inflammation, while their presence in mucus and on the skin prevents pathogen attack. Methods by which antibodies inhibit infection: Antibodies may inhibit infection by (a) preventing the antigen from binding its target, (b) tagging a pathogen for destruction by macrophages or neutrophils, or (c) activating the complement cascade. The production of antibodies by plasma cells in response to an antigen is called active immunity. This describes the host’s active response of the immune system to an infection or to a vaccination. There is also a passive immune response wherein antibodies are introduced into the host from an outside source, instead of the individual’s own plasma cells. For example, antibodies circulating in a pregnant woman’s body move across the placenta into the developing fetus. The child benefits from the presence of these antibodies for up to several months after birth. In addition, a passive immune response is possible by injecting antibodies into an individual in the form of an antivenom to a snake-bite toxin or antibodies in blood serum to help fight a hepatitis infection, giving immediate relief. Cell-mediated immunity involves cytotoxic T cells recognizing infected cells and bringing about their destruction. Once a pathogen enters a cell, it can no longer be detected by the humoral immune response; instead, the cell-mediated immune response must take over to kill the infected cell before it can allow the virus or bacteria to replicate and spread. T cells recognize infected cells by interacting with antigen present on their MHC II molecules; before a T cell can do so, it must be activated via interaction with an antigen presenting cell, or APC. Once a cytotoxic T cell (TC) is activated, it will clone itself, producing many TC cells with the correct receptors; some portion of the cells are active and will help destroy infected cells, while others are inactive memory cells that will create more active TC cells if the infection returns. Helper T cells (TH cells) also aid in cell-mediated immunity by releasing signaling molecules known as cytokines which can recruit natural killer cells and phagocytes to destroy infected cells and further activate TC cells; they do not directly destroy pathogens. Just as the humoral immune response has B cells which mediate its response, the cellular immune response has T cells, which recognize infected cells and destroy them before the pathogen inside can replicate and spread to infect other cells. Unlike B cells, T lymphocytes (T cells) are unable to recognize pathogens without assistance. First, an antigen-presenting cell (APC, such as a dendritic cell or a macrophage ) detects, engulfs (via phagocytosis in the case of macrophages or by entry of the pathogen of its own accord in the case of dendritic cells), and digests pathogens into hundreds or thousands of antigen fragments. These fragments are then transported to the surface of the APC, where they are presented on proteins known as Major Histocompatibility Complexes class II (MHC II, see ). T cells become activated towards a certain antigen once they encounter it displayed on an MHC II. After a virus or bacteria enters a cell, it can no longer be detected by the humoral immune response. Instead, the cellular immune response must take over. To do so, a T cell will become activated by interacting with an antigen of the infecting cell or virus presented on the MHC II of an APC. APCs, MHCs and lymphocytes: An antigen-presenting cell (APC), such as a macrophage, engulfs a foreign antigen, partially digests it in a lysosome, and then embeds it in an MHC class II molecule for presentation at the cell surface. Lymphocytes of the adaptive immune response must interact with antigen-embedded MHC class II molecules to mature into functional immune cells. There are two main types of T cells: helper T lymphocytes (TH) and the cytotoxic T lymphocytes (TC). The TH lymphocytes function indirectly to tell other immune cells about potential pathogens, while cytotoxic T cells (TC) are the key component of the cell-mediated part of the adaptive immune system which attacks and destroys infected cells. TC cells are particularly important in protecting against viral infections because viruses replicate within cells where they are shielded from extracellular contact with circulating antibodies. Once activated, the TC creates a large clone of cells with one specific set of cell-surface receptors, similar to the proliferation of activated B cells. As with B cells, the clone includes active TC cells and inactive memory TC cells. The resulting active TC cells then identify infected host cells. TC cells attempt to identify and destroy infected cells by triggering apoptosis (programmed cell death) before the pathogen can replicate and escape, thereby halting the progression of intracellular infections. To recognize which cells to pursue, TC recognize antigens presented on MHC I complexes, which are present on all nucleated cells. MHC I complexes display a current readout of intracellular proteins inside a cell and will present pathogen antigens if the pathogen is present in the cell. TC cells also support NK lymphocytes to destroy early cancers. Cytokines are signaling molecules secreted by a TH cell in response to a pathogen-infected cell; they stimulate natural killer cells and phagocytes such as macrophages. Phagocytes will then engulf infected cells and destroy them. Cytokines are also involved in stimulating TC cells, enhancing their ability to identify and destroy infected cells and tumors. A summary of how the humoral and cell-mediated immune responses are activated appears in. B plasma cells and TC cells are collectively called effector cells because they are involved in “effecting” (bringing about) the immune response of killing pathogens and infected host cells. Helper T cells in the immune response: A helper T cell becomes activated by binding to an antigen presented by an APC via the MHCII receptor, causing it to release cytokines. Depending on the cytokines released, this activates either the humoral or the cell-mediated immune response. The lymphatic system houses large populations of immune cells which are released upon detection of a pathogen. The lymphatic system contains lymph: a fluid that bathes tissues and organs and contains white blood cells (not red blood cells). Once B and T cells mature, the majority of them enter the lymphatic system, where they are stored in lymph nodes until needed. Lymph nodes also store dendritic cells and macrophages; as antigens are filtered through the lymphatic system, these cells collect them so as to present them to B and T cells. The spleen, which is to blood what lymph nodes are to lymph, filters foreign substances and antibody -complexed pathogens from the blood. Lymph, the watery fluid that bathes tissues and organs, contains protective white blood cells, but does not contain erythrocytes (red blood cells). Lymph moves about the body through the lymphatic system, which is made up of vessels, lymph ducts, lymph glands, and organs such as tonsils, adenoids, thymus, and spleen. Although the immune system is characterized by circulating cells throughout the body, the regulation, maturation, and intercommunication of immune factors occur at specific sites that are known as lymph nodes. The blood circulates immune cells, proteins, and other factors through the body. Approximately 0.1 percent of all cells in the blood are leukocytes, which include monocytes (the precursor of macrophages) and lymphocytes. Most cells in the blood are red blood cells. Cells of the immune system can travel between the distinct lymphatic and blood circulatory systems, which are separated by interstitial space, by a process called extravasation (passing through to surrounding tissue). Recall that cells of the immune system originate from stem cells in the bone marrow. B cell maturation occurs in the bone marrow, whereas progenitor cells migrate from the bone marrow and develop and mature into naïve T cells in the organ called the thymus. On maturation, T and B lymphocytes circulate to various destinations. Lymph nodes scattered throughout the body house large populations of T and B cells, dendritic cells, and macrophages. Lymph gathers antigens as it drains from tissues. These antigens are filtered through lymph nodes before the lymph is returned to circulation. Antigen-presenting cells (APCs) in the lymph nodes capture and process antigens, informing nearby lymphocytes about potential pathogens. Lymphatic system: (a) Lymphatic vessels carry a clear fluid called lymph throughout the body. The liquid passes through (b) lymph nodes that filter the lymph that enters the node through afferent vessels, leaving through efferent vessels. Lymph nodes are filled with lymphocytes that purge infecting cells. The spleen houses B and T cells, macrophages, dendritic cells, and NK cells. The spleen is also the site where APCs that have trapped foreign particles in the blood can communicate with lymphocytes. Antibodies are synthesized and secreted by activated plasma cells in the spleen, which filters foreign substances and antibody-complexed pathogens from the blood. Functionally, the spleen is to the blood as lymph nodes are to the lymph. Spleen in the lymphatic system: The spleen functions to immunologically filter the blood and allow for communication between cells corresponding to the innate and adaptive immune responses. Immunological memory allows the adaptive immune system to very rapidly clear infections that it has encountered before. During the adaptive immune response to a pathogen that the body has not previously encountered (the primary immune response), the level of plasma cells that secrete antibodies to the new pathogen and T cells that recognize the pathogen will increase at a modest pace. If a pathogen is re-encountered, memory B and T cells can immediately differentiate into plasma cells and cytotoxic T cells without input from APCs or TH cells; this secondary immune response occurs much more rapidly than the primary immune response. Vaccination can be used to generate a mild, primary immune response against an inactivated pathogen, which will allow the secondary immune response to function the first time the immune system encounters the actual pathogen. The adaptive immune system has a memory component that allows for a rapid and large response upon re-invasion of the same pathogen. During the adaptive immune response to a pathogen that has not been encountered before, known as the primary immune response, plasma cells secreting antibodies and differentiated T cells increase, then plateau over time. As B cells and T cells mature into effector cells, a subset of the naïve populations differentiates into B and T memory cells with the same antigen specificities. A memory cell is an antigen-specific B or T lymphocyte that does not differentiate into an effector cell during the primary immune response, but that can immediately become an effector cell on re-exposure to the same pathogen. As the infection is cleared and pathogenic stimuli subside, the effector cells are no longer needed; they undergo apoptosis. In contrast, the memory cells persist in circulation. Formation of memory B cells and plasma cells: After initially binding an antigen to the B cell receptor (BCR), a B cell internalizes the antigen and presents it on MHC II. A helper T cell recognizes the MHC II–antigen complex and activates the B cell. As a result, memory B cells and plasma cells are made. If the pathogen is not encountered again during the individual’s lifetime, B and T memory cells will circulate for a few years or even several decades, gradually dying off, having never functioned as effector cells. However, if the host is re-exposed to the same pathogen type, circulating memory cells will immediately differentiate into plasma cells and TC cells without input from APCs or TH cells. This is known as the secondary immune response. One reason why the adaptive immune response is delayed is that it takes time for naïve B and T cells with the appropriate antigen specificities to be identified, activated, and proliferate. On reinfection, this step is skipped. The result is a more rapid production of immune defenses. Memory B cells that differentiate into plasma cells output ten to hundred-fold greater antibody amounts than were secreted during the primary response. This rapid and dramatic antibody response may stop the infection before it can even become established. Individuals may not realize they had been exposed. 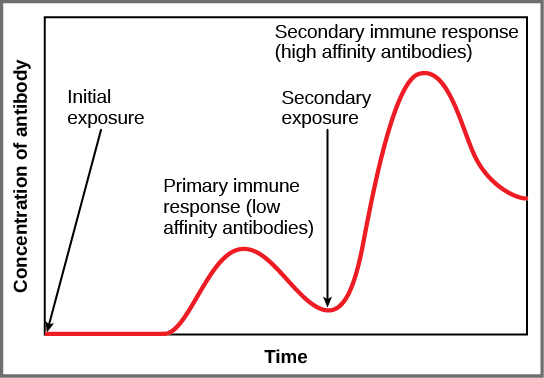 Primary versus secondary immune response: In the primary response to infection, antibodies are secreted first from plasma cells. Upon re-exposure to the same pathogen, memory cells differentiate into antibody-secreting plasma cells that output a greater amount of antibody for a longer period of time. Vaccination is based on the knowledge that exposure to noninfectious antigens, derived from known pathogens, generates a mild primary immune response. The immune response to vaccination may not be perceived by the host as illness, but still confers immune memory. When exposed to the corresponding pathogen to which an individual was vaccinated, the reaction is similar to a secondary exposure. Because each reinfection generates more memory cells and increased resistance to the pathogen, some vaccine courses involve one or more booster vaccinations to mimic repeat exposures. 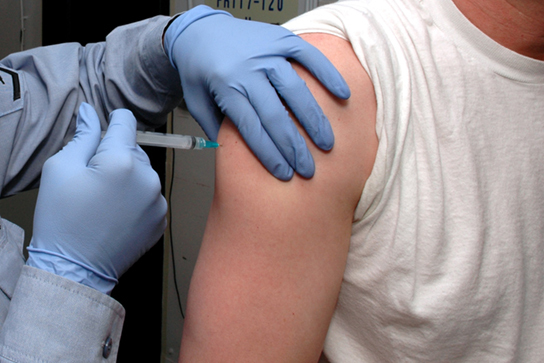 Vaccination: Vaccines, often delivered by injection into the arm, result in a secondary immune response if the vaccinated individual is later exposed to that pathogen. Immune tolerance of self and harmless antigens occurs by deleting B and T cells that recognize those antigens, often near mucosal surfaces. Mucosal surfaces are those that are in contact with air, but, unlike the skin, allow fluid to flow in and out of them. Due to the location of mucosal surfaces, they are often the first sites to encounter new antigens. The immune system has to be regulated to prevent wasteful, unnecessary responses to harmless substances and, more importantly, so that it does not attack “self”. Mucosal-associated lymphoid tissue, or MALT, is involved in immune tolerance to harmless, foreign antigens. The innate and adaptive immune responses discussed thus far comprise the systemic immune system (affecting the whole body), which is distinct from the mucosal immune system. Mucosa are another name for mucous membranes. Mucosal immunity is formed by mucosa-associated lymphoid tissue, or MALT, which functions independently of the systemic immune system; it has its own innate and adaptive components. MALT is a collection of lymphatic tissue that combines with epithelial tissue lining the mucosa throughout the body. This tissue functions as the immune barrier and immune response in areas of the body in direct contact to the external environment. The systemic and mucosal immune systems use many of the same cell types. Foreign particles that make their way to MALT are taken up by absorptive epithelial cells called M cells and delivered to APCs (antigen-presenting cells) located directly below the mucosal tissue. M cells are located in the Peyer’s patch, which is a lymphoid nodule. APCs of the mucosal immune system are primarily dendritic cells, with B cells and macrophages playing minor roles. Processed antigens displayed on APCs are detected by T cells in the MALT and at various mucosal induction sites, such as the tonsils, adenoids, appendix, or the mesenteric lymph nodes of the intestine. Activated T cells then migrate through the lymphatic system and into the circulatory system to mucosal sites of infection. MALT tissue: The topology and function of intestinal MALT is shown. Pathogens are taken up by M cells in the intestinal epithelium and excreted into a pocket formed by the inner surface of the cell. The pocket contains antigen-presenting cells, such as dendritic cells, which engulf the antigens, then present them with MHC II molecules on the cell surface. The dendritic cells migrate to an underlying tissue called a Peyer’s patch. Antigen-presenting cells, T cells, and B cells aggregate within the Peyer’s patch, forming organized lymphoid follicles. There, some T cells and B cells are activated. Other antigen-loaded dendritic cells migrate through the lymphatic system where they activate B cells, T cells, and plasma cells in the lymph nodes. The activated cells then return to MALT tissue effector sites. IgA and other antibodies are secreted into the intestinal lumen. MALT is a crucial component of a functional immune system because mucosal surfaces, such as the nasal passages, are the first tissues onto which inhaled or ingested pathogens are deposited. This allows the immune system to detect and deal with pathogens very quickly after they enter the body through various mucous membranes. The mucosal tissue includes the mouth, pharynx, and esophagus, along with the gastrointestinal, respiratory, and urogenital tracts. The immune system has to be regulated to prevent wasteful, unnecessary responses to harmless substances and, more importantly, so that it does not attack “self.” The acquired ability to prevent an unnecessary or harmful immune response to a detected foreign substance known not to cause disease or to self-antigens is described as immune tolerance. The primary mechanism for developing immune tolerance to self-antigens occurs during the selection for weakly, self-binding cells during T and B lymphocyte maturation. Any T or B lymphocytes that recognize harmless foreign or “self” antigens are deleted before they can fully mature into immunocompetent cells. There are populations of T cells that suppress the immune response to self-antigens. They also suppress the immune response after the infection has cleared to minimize host cell damage induced by inflammation and cell lysis. Immune tolerance is especially well developed in the mucosa of the upper digestive system because of the tremendous number of foreign substances (such as food proteins) that APCs of the oral cavity, pharynx, and gastrointestinal mucosa encounter. Immune tolerance is brought about by specialized APCs in the liver, lymph nodes, small intestine, and lung that present harmless antigens to a diverse population of regulatory T (Treg) cells: specialized lymphocytes that suppress local inflammation and inhibit the secretion of stimulatory immune factors. The combined result of Treg cells is to prevent immunologic activation and inflammation in undesired tissue compartments, allowing the immune system to focus on hazardous pathogens instead.